In speaking of Adobe Premiere, we all know that it is the professional video editing software with timeline and special effects. Though Premiere Pro has announced the compatibility with MP4, people still have problems in importing MP4 to Premiere sometimes. So what is the matter on earth? And how can we successfully import MP4 to Adobe Premiere at any time? This article aims to solve the above questions in two parts. Why people often fail to import MP4 into Premiere? How to successfully import all kinds of MP4 into Premiere? In order to import MP4 to Premiere, we can either convert this MP4 video to Adobe Premiere supported MP4 format or convert this MP4 video to other Premiere friendly movie format like DV, MPEG-2, FLV and more. 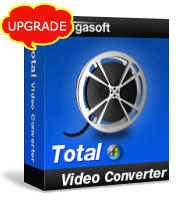 Luckily, Bigasoft Total Video Converter is able to do both of the above conversion: Convert Premiere unsupported MP4 to Premiere supported MP4; Convert Premiere unsupported MP4 to Premiere compatible other video formats like MPEG-2, FLV, DV and more. The following will take converting MP4 to Adobe Premiere supported MP4 as an example. It also applies to converting MP4 to other Adobe Premiere supported format. And it applies to all kinds of Adobe Premiere including Adobe Premiere Pro, Adobe Premiere Pro CS3/ CS4/ CS5. Free download the professional MP4 to Premiere Converter - Bigasoft Total Video Converter (Windows Version , Mac Version ) install and run it, the following interface will pop up. Click "Add File" button to to import the unsupported MP4 video file. 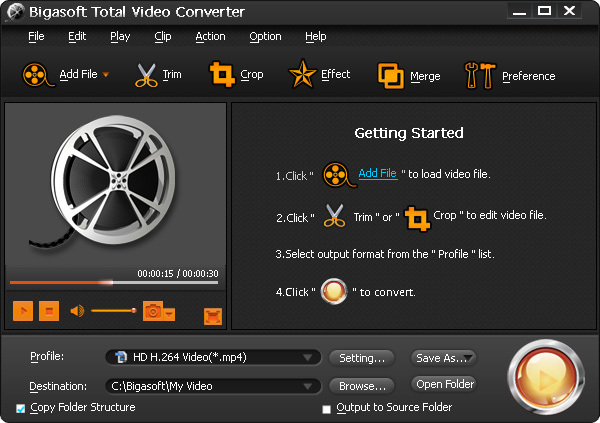 Or you can also drag your MP4 video directly to the main interface of Bigasoft Total Video Converter. Click "Convert" button to finish converting MP4 video file. First start Adobe Premiere, then select File > Import from the main menu to import the converted MP4 to Premiere. It is dead easy to import all kinds of MP4 files to Adobe Premiere, Adobe Premiere Pro, Adobe Premiere Pro CS3/ CS4/ CS5 With this powerful Bigasoft Total Video Converter! Wait no more, just free download it and have a try!